At Sugar Haven Farms, we sell very high quality pastured meats from our healthy, naturally raised animals. In addition, we seek out other local producers offering product lines that meet our high standards, and include them in our inventory for our customers to enjoy. Jams and herbal teas. All herbal teas are made from herbs grown on the Ort Family Farm in Bradford NY. With organic packaging, even the bags with the herbs in them are enviromentally friendly. The Ort family is adding on to their inspected kitchen to accommodate the increase in demand for their products. 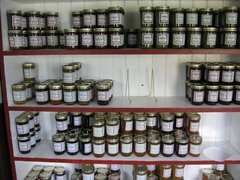 Most of the jams are seasonal so be on the lookout for new jams and jellies. The inventory will change to reflect the bounty of which fruit is in season. This farm has been making honey for three generations. It is safe to say they have the recipe down perfect! Leo's Honey House, managed by grandaughter Cathy Halm, is more than just a honey producer. Cathy has spent her time studying and implementing disease control methods that do not use pesticides, antibiotics, or antifungals. The extra time and care is necessary to make sure Leo's Honey House is selling only the best and cleanest honey and we are fortunate to have her honey in inventory. 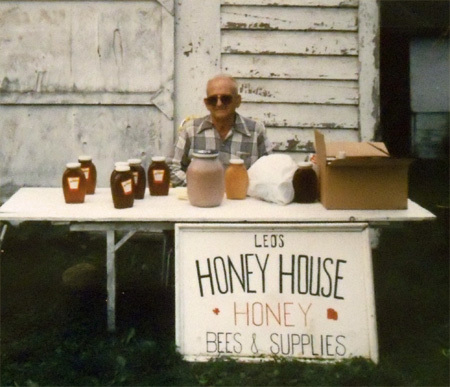 Above is Cathy's Grandfather selling the honey he made in the early days. Cathy has grown the business to two bee yards with over 30 bee hives in total!